Jaipur is the famous city of Rajasthan that attracts many tourists every year. If you are planning a trip to Jaipur and don’t know what all place to visit in Jaipur then you have landed up at a right place. Jaipur a famous tourist destination in Rajasthan includes number of tourist attractions. Jal Mahal and Hawa Mahal are the two most famous tourist attractions of Jaipur. On your trip to Jaipur, you must not miss to visit these Mahals. Jal Mahal in Jaipur was built by Sawai Pratap Singh, who was the ruler of Jaipur from 1778 to 1803. He has also built the famous Hawa Mahal. These two Mahals are the major attractions of Jaipur that attracts many tourists from all over the world. Jal Mahal which means water Palace in English is really beautiful. This palace is situated in the middle on the Man Sagar Lake. This palace has five floors and out of which four floors are under water and only the top floor is above the water level. 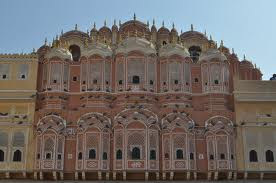 Hawa Mahal which means the palace of winds in English is the signature building of Jaipur. This beautiful palace was built for the women of the royal family to have view of the ceremonial processions on the street while seated behind the windows. The windows of this palace are built in such a way that no one could see the women from street.